I have been reading preseason college football magazines for longer than I care to remember. I am always excited about their arrival in stores, although it seems like a lot of the same storylines surface annually. 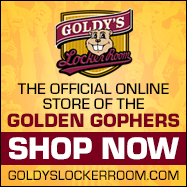 Hint to Goldy Gopher: no Big Ten titles since 1967. Years ago the magazines hit the newsstands in August but now the preseason publications arrive a few weeks before the official start of summer. Maybe you spend a spring weekend breaking your back in the garden but I dedicate a few days devouring college football news from coast-to-coast. I’ve been doing it since Saturday’s heroes posed for covers wearing helmets without facemasks. These days the magazines hit town and deliver “sticker shock.” I bought three magazines and swallowed hard when the cashier said the total was over $31. I do confess to only paying $13 after using a Barnes & Noble gift card, and receiving a loyalty discount from the retailer. I am not sure you want to hear me complain about the cost. Certain things are best kept private, which reminds me of the “wisdom” of former Golden Gopher football coach Lou Holtz. He advises those who complain about aches and pain to think twice before sharing their woes with others. Holtz says 90 percent of those you complain to really don’t care, while the other 10 percent are happy you’re hurting! The three magazines—the Athlon and Lindy’s Big Ten preview publications, and Athlon’s national outlook magazine—are not doing celebratory backflips over the Golden Gophers who were 2-7 in Big Ten games last season and have some attributes missing on their resume including no experience at the quarterback position. 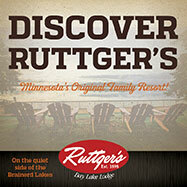 The publications aren’t holding back their concerns about Minnesota. “It doesn’t make any difference how fast you row the boat if it has holes in it. And this boat has many leaks,” writes Lindy’s. Both Athlon and Lindy’s see Minnesota as the sixth best team in the Big Ten’s seven-team West Division. Athlon predicts the Gophers’ overall record will be 6-6 and 3-6 in Big Ten games. For the postseason Athlon says Minnesota will play in the Heart of Dallas Bowl against North Texas. Lindy’s ranks the Gophers running backs (because of Rodney Smith) No. 6 in the 14-team Big Ten. The linebackers are ranked No. 7. Minnesota lands at No. 12 in the quarterbacks, receivers, offensive line and specialists categories. The defensive line is No. 11 and the secondary No. 13. I know my readers like good news so let me intervene here with a thought to boost morale. The schedule could allow the Gophers—whose strength figures to be on defense—to start fast. Nonconference games (all at home) against New Mexico State, Fresno State and Miami (Ohio) should provide a 3-0 start. Then comes the Big Ten opener at Maryland and the Terps are trying to rebuild just like Goldy. A 4-0 start is possible before the Gophers host Iowa on October 6. Minnesota may not reclaim the pig but at least should go into the game with confidence, a winning early season record and the incentive of playing in front of what almost for sure will be the largest home crowd of the year. After that the schedule is mostly formidable, and at times nasty. Even Tony Robbins would struggle to find a silver lining in road mismatches at Ohio State and Wisconsin. Tony, though, could point to potentially winnable games including against lowly Illinois. Another smiley thought is Minnesota avoids three of the Big Ten East’s beasts with Michigan, Michigan State and Penn State not on the schedule. If the Gophers are to achieve a winning season they will need many breakout performances from individual players, particularly on offense. The list starts with redshirt freshman Tanner Morgan at football’s most important position, quarterback. He’s an unknown, just like four-star freshman wide receiver Rashod Bateman who can give the offense a big lift if he is as effective as hyped. Senior tackle Donnell Greene’s name is mentioned as a potential NFL Draft choice and he could be a difference maker on an offensive line that is suspect. Minnesota has a short list of highly regarded players the magazines include on their second and third team All-Big Ten selections. Running back Smith (already referenced above) made Lindys’ second team. 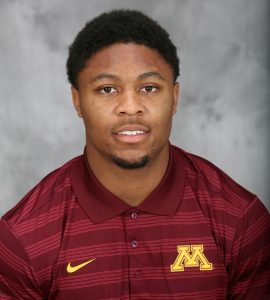 Athlon placed Smith on its second team offense as an all-purpose player, and also made four Gophers third team selections on either defense or offense: linebacker Thomas Barber, defensive end Carter Coughlin, wide receiver Tyler Johnson, and safety Antoine Winfield Jr. If those five can be even better than anticipated, Minnesota increases its chances for a surprise season. It’s interesting that all of the players except Smith are from the state of Minnesota. Also included on preseason Big Ten honor teams are two other Minnesota natives, and they both played high school football at Eden Prairie. Linebacker Ryan Connelly is one of nationally ranked Wisconsin’s best players, while wide receiver and kickoff returner J.D. Spielman is a constant scoring threat for Nebraska. Gophers’ second-year coach P.J. Fleck can’t fix his boat with only players from the state of Minnesota but better recruiting in Minnesota and Wisconsin is a must. FCS powerhouse North Dakota State has built its program mostly with Upper Midwest players including a boatload from Minnesota and Wisconsin. As for the Badgers, they have taken over the Big Ten’s West Division and become a national playoff contender with a formula that includes a thundering herd of offensive linemen—mostly from the state of Wisconsin. Like it or not, expect to hear more in 2018 from Fleck about his culture and process in building his program after last year’s 5-7 record that followed a 9-4 in 2016. The 37-year-old, who was 1-11 his first year coaching at Western Michigan and 8-5 in his second, usually has plenty to say as Athlon noted in an anonymous quote from a coach at another school. That quote was among the first words I read after I bought my magazines. In the days ahead I will read the publications cover-to-cover including the (yawn) anticipated national successes of the Alabamas, Clemsons, Georgias, Ohio States and Wisconsins. I will wince at six-time national champion Minnesota being ranked No. 73 in the country by Athlon—just behind No. 72 Arkansas State! And, yes, I will even look forward to purchasing three or four college football magazines again next year. I better start saving up. How soon will there be a $12 college football magazine in my future?